Why Does My Air Conditioner Freeze Up All the Time? How Does Duct Cleaning Work? Air conditioner front panels can be removed to access the fan housing. If an air conditioner is stored in a dusty area, such as a garage, for several months, dust can accumulate on the surface of the unit’s components, such as the condenser fan. When the air conditioner activates, dirt and impure particles fly off the components of the AC, out of the air vents and into the room. Front or side panels can be removed from the unit so you can clean the interior. The interior should be thoroughly cleaned about once a year with compressed air or a mild cleaner before the unit is used. Air conditioner systems or units that have ductwork might be the cause of particles blowing from the fan of the unit. Over time, some ducts can deteriorate into small black particles, which detach from the lining of the duct and escape through the vents. These particles can be harmful to your health if inhaled. A technician should be called to determine whether the ducts cause the problem. If so, they should be replaced immediately. It’s possible for an old or dirty filter to cause the unit to blow particles into the room or home. Open the front grille of the air conditioner system to reveal the air filter and examine its state. If it’s dirty, depending on the unit, the filter can either be cleaned or must be replaced. A reusable filter can be cleaned with a vacuum cleaner or running water. Before reinsertion, the cleaned filter should be dry. In some units over time, the heat exchanger could burn up and produce soot or ash that flies out of the air conditioner vents. If you suspect the heat exchanger, the unit should be deactivated as soon as possible as a safety measure. A technician should be called to replace the exchanger to repair the unit and stop particle distribution. Storage in a humid room or space causes humidity inside the unit, which is a perfect breeding ground for harmful mold. The mold collects on or around the fan so that when the fan turns on, particles of mold blow out of the outlet vent and onto floors, walls and furniture. Remove the front or side panels to reveal the fan compartment. After the fan is cleaned with a mild cleaner, it should not only spin freely but also blow cleanly. Why Won't My Air Conditioner Kick In Even When the Fan Runs? 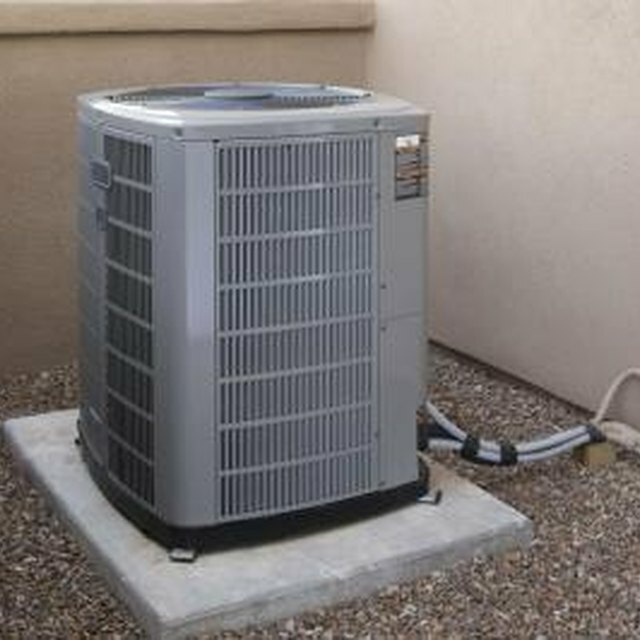 Should I Cover My Central Air Conditioner Unit? Why Would My Air Conditioner Shut Off Too Soon? How Can I Tell If I Have Black Mold in My Air Vents? Do Natural Gas Boilers and Furnaces Need to Be Cleaned?